Vortex Communications manufactures and supplies video and audio equipment to broadcasters and system builders worldwide from its base in the UK. We also import and distribute products for a number of partner companies. CallMe Click-&-Connect - lets guest contributors go live with high-quality audio without the need for a hardware IP codec or downloading a software codec. The studio sends a web link which the guest clicks on to connect to the studio codec. Many stations use it also for their reporters to connect. We offer a free 14-day trial of CallMe Click-and-Connect for which we provide the full setup service. You can also try it by heading to www.callme.fm which connects to our CallMe-T here in Ealing which is connected to a radio tuner. When subscribing to CallMe you will receive a dedicated webpage which connects directly to your chosen codecs with high quality, low delay audio. CallMe is compatible with BRIC-Link, ACCESS and STAC-VIP Talkshow system, taking full advantage of 12 lines on the STAC-VIP from a single webpage. Customise your page, fit your logo or change the background image to suit you and the only thing the contributor needs to do is click the link and click 'Call Me'. Since ACCESS was introduced over a decade ago, it has become the world’s leading IP audio codec. And in that time, IP transmission technology has developed significantly. We’ve taken our world-class platform, along with the last decade of technical growth, and built a brand new platform for the future – ACCESS NX. 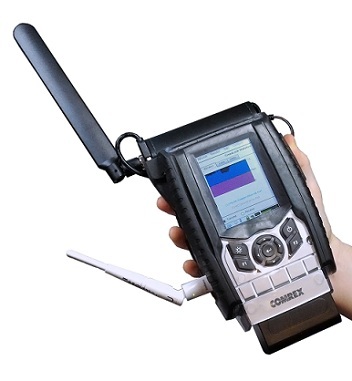 The Comrex ACCESS especially comes into its own on mediocre and contended connections as can happen when using 3G/4G over the public internet. BRUTE Broadcast-Reliable-UDP-Enhancement and Congestion Avoidance further increase the robustness of the connection where packet losses of 25% and above are barely noticed. ACCESS NX is the ultimate tool to take advantage of these advances. Designed from the ground up as a platform for CrossLock, our sophisticated custom reliability layer, ACCESS NX is the next step in innovative portable broadcasting. There is a very large installed base of ISDN mixer-codecs from various manufacturers where the audio mixing and cue capabilities are well-understood and liked but these are only able to connect to the studio using ISDN. 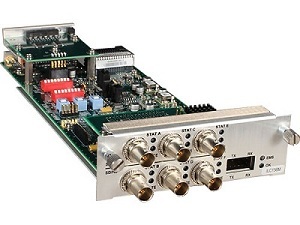 CallMe-TR is a small-size, low-cost IP Audio Codec supporting Opus/G.722 audio coding algorithms with stereo audio inputs and outputs on ¼" jacks plus RJ45 Ethernet connectivity. It has been developed as an add-on to provide a low-cost IP connectivity solution for these mixers. It is housed in a 108mm x 103mm x 44mm enclosure for table-top use and has four "Call" buttons on the front panel that provide eight "Quick Dial" connections and a single "Drop" button to disconnect. CallMe-TR is compatible with most IP Audio Codecs including CallMe-TS which provides a low-cost back-end for studio use. Four can be housed side-by-side in a 1-U rack. 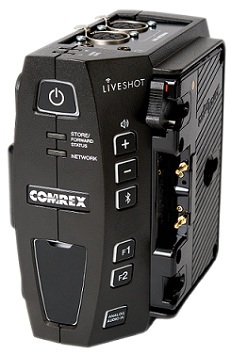 LiveShot 2nd Generation multi-stream codec from Comrex provides ultra-low latency, full-duplex HD/SD plus Comms over single or multiple IP connections. 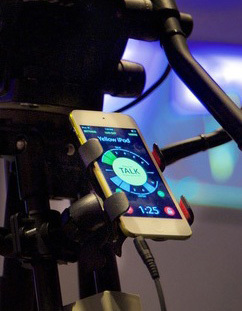 Using techniques carried over from the industry-standard ACCESS, LiveShot uses the same technology to stream video and audio over challenging public Internet connections such as 3G, 4G, WiFi and satellite, at bitrates from 32kb/s to 20Mb/s which it can combine for bonding and diversity without the need for additional hardware. LiveShot uses state-of-the-art H.264 HIGH Profile video and AAC-ELD audio coding with less than 200ms delay, while its intelligent buffer manager keeps latency to a minimum on any network, making LiveShot the ideal tool for live two-way outside broadcasts. As well as the full-duplex video and audio stream, LiveShot provides an independent two-way cue / IFB channel which is available via Bluetooth or a wired headset in the field. The LiveShot Switchboard Server provided by Comrex will allow remote management of your whole family of LiveShot codecs directly from a web browser and Android/iOS devices. Switchboard offers Crosslock VPN for improved stability and reliability along with redundancy over typical Video and Audio streams. Improving the standard set by its predecessor. BRIC-Link high-performance IP Audio Codecs are designed for point-to-point and point-to-multi-point Audio connections and use Comrex's revolutionary BRIC technology (Broadcast-Reliable Internet Codec) to deliver low-delay, jitter-free, high-quality mono or stereo audio over IP networks. Both BRIC-Link versions are capable of analogue and digital audio I/O, and can send linear or compressed audio with very low delay. Uncompressed PCM plus compressed FLAC Lossless Audio Coding and AAC algorithms are all included as standard. End-to-end contact closures and ancillary serial data are also provided. Support for OPUS has been seamlessly implemented and Dual-Streaming capability will be available through the units additional USB slot. The Industry-standard ACCESS Audio codec just got better with the addition of Opus Codecs and Dual-Streaming capability. Of major significance, is the addition of Dual Streaming capability which allows the use of two or more different data paths to connect back to base. Until now, this has required the use of an expensive external network-combining device and this important capability is now included within the ACCESS-2USB. Any number of network connections can be enabled from any of the units and Crosslock can bond and diversify as well as allow you to monitor the connection. OPUS Codecs which provide low-delay robust high quality audio are now included in the ACCESS family including the BricLink. Having OPUS as standard, allows compatibility with the Vortex CallMe Browser codec that lets guests and reporters connect directly to the Studio without the need to send out equipment or for the guest to visit the studio. Clicking on a web link “goes Live”. 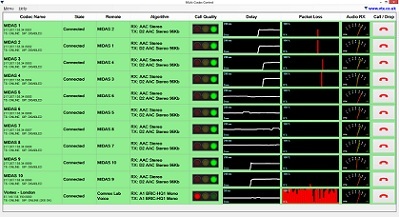 MCC is the BRIC IP Codec Management Software that helps control, maintain and monitor your ACCESS, BRIC-Link or MIDAS codecs. All functions from the remote end including Call/Drop and monitoring Packet Loss, Delay, Call Quality and many other parameters to help keep your broadcast seamless and hassle free with full control of your codecs from a single instance of Windows. Set up your profiles, change system settings, add new contacts all from the same display. Unity Intercom provides a low-cost, novel and reliable IP intercom system that allows you to use your existing smartphones as Intercom stations. Unity works by connecting over Wi-Fi or via a mobile network to a “Unity Server” providing Talk and Listen on multiple independent channels, as well as an independent programme audio feed. Unity can also display camera “On-Air” Tally and integrates with hard-wired communication systems like Clear-Com or RTS, letting you use Unity as a wireless station. For the mobile intercom stations, the appropriate iOS or Android Unity app is downloaded (free), Listen and Talk channels are selected – then simply Push-to-Talk (PTT). The smartphones can be equipped with headsets – either cabled or Bluetooth – or used in speaker mode. Unity Clients are available for Mac, Windows PC and Windows Touch for use with a Tablet. Our entire V-400 clock range has received an engineering and design refresh to provide enhanced operability, lower power consumption and additional features. The displays themselves are clearer and infra-red remote control for setup is included as standard, as is stopwatch operation. Additional digit and case colours also available. The new TimeLord-µNet is a small, cost-effective solution to time referencing, a simple small form factor NTP time server that includes its own GPS antenna for an accurate time reference. TimeLord-µNet comes with PoE capabilities and will lock to GPS on power up with very little user interaction needed. InfinityLink provides broadcast-quality transport of video, audio, and data across IP- and fiber-based networks and optical backbones in an integrated modular solution leveraging Artel’s 30 years of media transport experience. 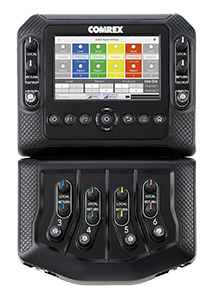 Designed specifically to meet the unique requirements of broadcast video transport, InfinityLink features a 4-slot, 1-RU chassis; multi-purpose, single-piece function modules with front panel accessible status LEDs and video monitor ports; and external optics in all standard wavelengths for each module. InfinityLink is one of the most flexible and dependable video transport platforms. 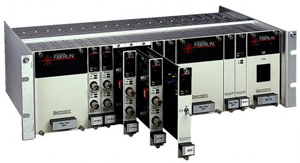 Fiberlink® is an extensive collection of Fibre-Optic transmission products that support video, audio and data signals. The range also includes a Modular Rack System for multi-channel operation plus other useful Fibre Optic add-ons and Accessories. The range includes devices for sending analogue and digital video (including 3G/HD/SDI), analogue and digital audio, computer video (VGA and DVI) and data over multi-mode or single mode fibre-optic cable.